This recipe is being featured on The Vegan Woman as a special birthday present for Sivan. I'm so honoured to be on the site! It's an excellent place for recipes, articles, resources and everything else you'd want to know about the plant-based life. Keep in mind that my adoration may be slightly biased because they voted me first place for best vegan food blog of 2013. Teehee. To make the crust: process the pecans into a rough flour in your food processor. Add the raisins and process until everything begins to stick together. Press into the bottom a small spring form pan. To make the cheesecake: blend all the ingredients until smooth, adding the coconut oil last and making sure it all combines completely. The mixture should be very thick and creamy. Scoop onto your crust and spread evenly. Put in the fridge, covered for 1-2 days so the flavours can develop. 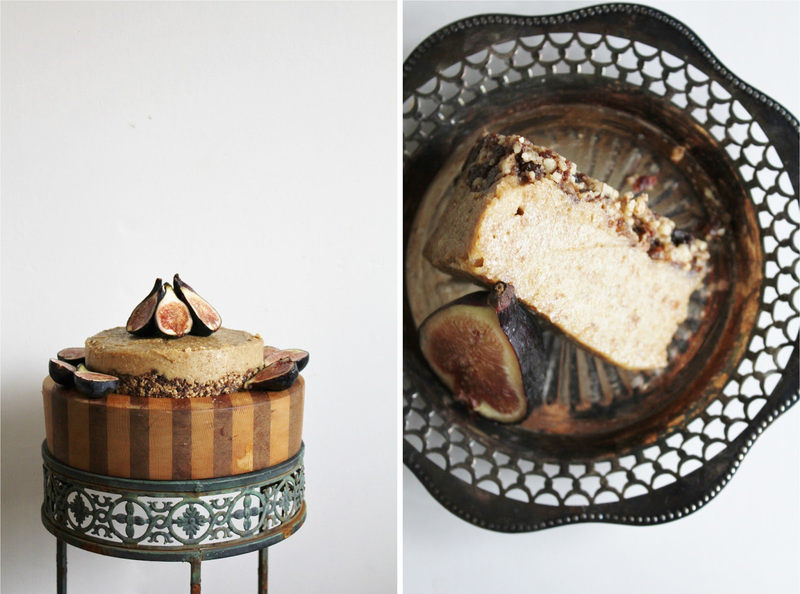 Garnish with the fresh figs and enjoy with ones you love!